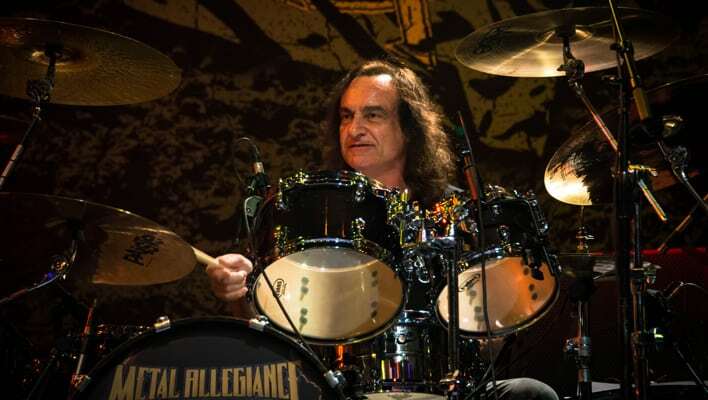 Having never been to The Parish Room at House of Blues Anaheim or having never seen Immortal Guardian before, I did my research on the band and was very curious on how they would sound live. 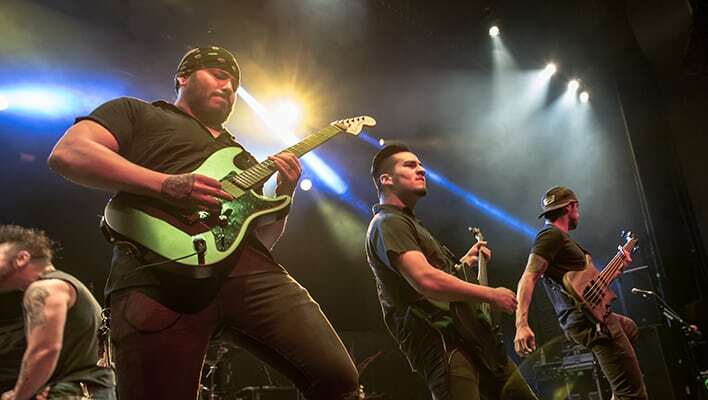 This band from Texas made headways with their music exposure on ESPN’s X Games and performing at NAMM Jam in the past which brought them to open for major name bands in the business. 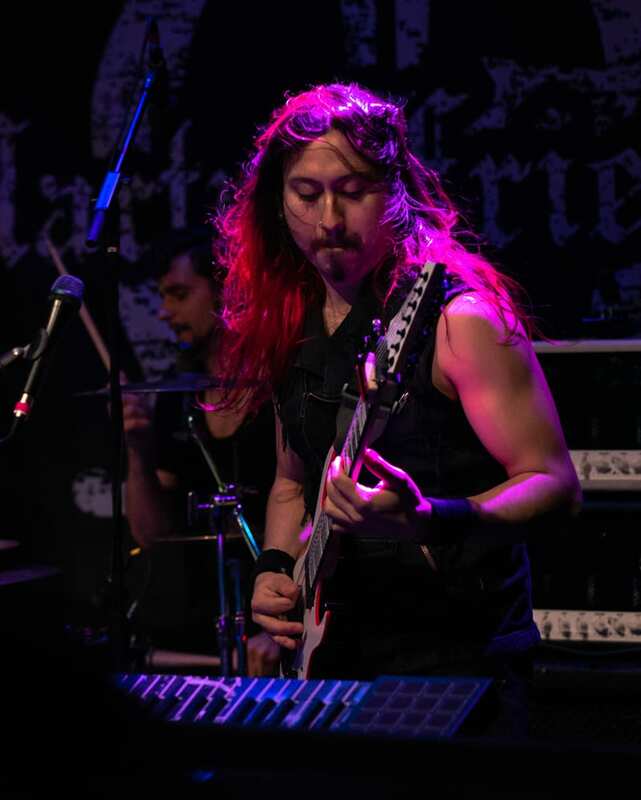 While NAMM 2019 was in full bloom in Anaheim, Immortal Guardian opened for guitar God Marty Friedman. Trying to get in, there was a huge line at the box office to get my credentials, since Metal Allegiance was playing next door. Finally walking into this small venue, it was hard to get up front to take photos since the place was packed. When Immortal Guardian came on, they blew me away! Guitarist Gabriel Guardian, playing both guitar and keyboards simultaneously, played a short instrumental before singer Carlos Zema came on. 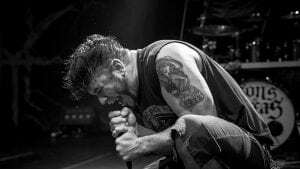 As a powerhouse on vocals, he kept impressing me. Everyone in this band brings pure talent to the table, Thad Stevens on bass and Cody Gilliland on drums. You could hear in the reaction of the crowd after each song that the applause kept growing louder and louder. Immortal Guardian sounds like a six piece instead of a four piece. 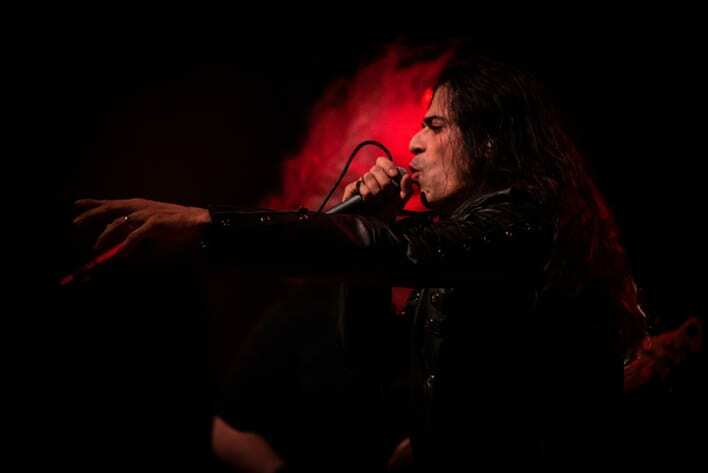 As a guitarist, my eye was drawn to Gabriel soloing on two instruments. With a couple of albums under their belt the latest came out late 2018. But nothing compares to seeing Immortal Guardian live. Even after the show the band hung around the merchandise booth, shaking hands and signing autographs. As I was saying before, it was so hard to get up front to take photos with a full crowd, but I was thankful for a good zoom lens. Often as a photographer I run across a band that I’m covering and get totally impressed. Immortal Guardian is one band that made me a fan. Be on the lookout for this band to make more waves. Walking into Pechanga Resort and Casino, waiting to see if my credentials were there, I was excited to see and photograph a rock legend – Alice Cooper. Once inside, they told me and the other photographers that we were allowed to shoot the first four songs. Normally it’s three! But as the lights went out, not having a photo pit at this venue the tricky thing is to try to fit in and not to get in the way of others watching the show. As soon as Alice came out the crowd was instantly on their feet. 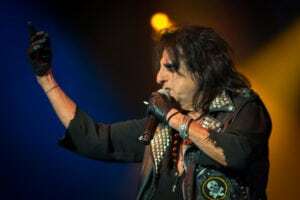 Alice knows how to entertain, and with an elite band as well. 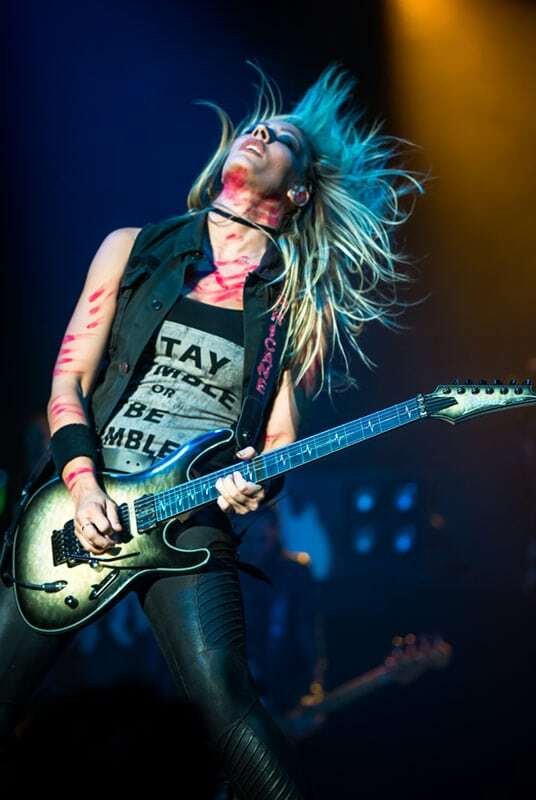 One thing to look for at his shows is his guitarist Nita Strauss, I like to call her the Queen of the 6-Strings. 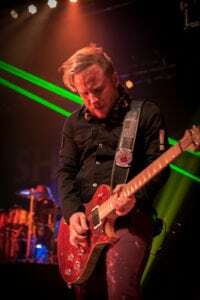 A phenomenal guitar player as well as Tommy Henrikson and Ryan Roxy, and Glen Sobel on drums and Chuck (Beasto Blanco) Garric on bass. Every musician in Alice’s band is top notch. As the songs play on so do his stage antics. From a fencing sword with money featuring Alice’s face being thrown to the crowd, to a monstrous “Alice” as a Frankenstein monster, to a guillotine where his stage hands throw him in and cut his head off executioner style. Alice finished the night wearing a white tux jacket while playing hits like “I’m Eighteen” and “School’s Out”, accompanied by a bubble machine. Personally, this was such a treat to shoot, just seeing someone that is 70 years young still touring and putting on a great show. 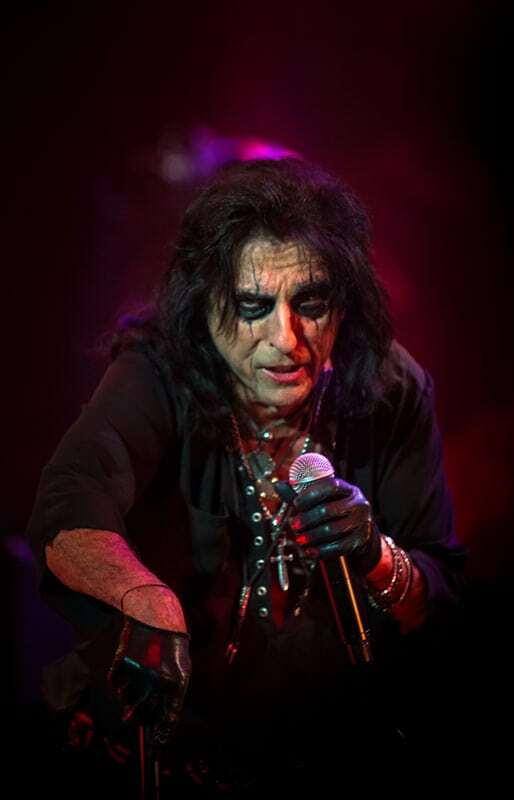 If you can, check out Alice Cooper and his amazing band on the Paranormal Tour. 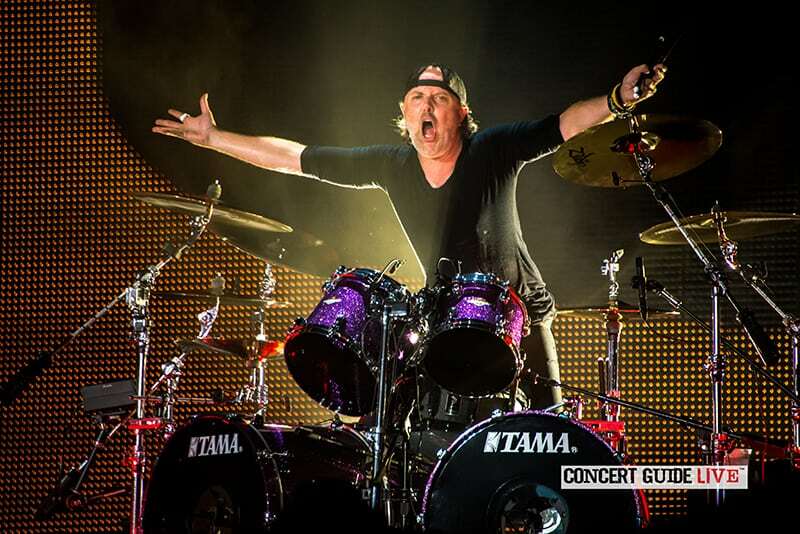 Swedish band Ghost kicked off their “Rats on the Road” tour in Riverside, California on May 5. A SOLD OUT show. Obviously, they have a huge following and for a photographer, a dream to shoot. 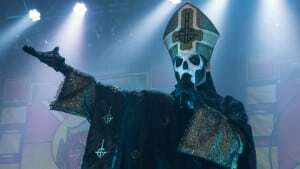 But the great thing was that only Ghost performed this night, no supporting band. A full show with just them. There were only six photographers allowed to shoot this show, which made the photo pit less crowded. If you follow the band, singer Papa Emeritus takes on a new persona as Cardinal Copia (with no black Pope outfit). There has been a big mystery going on with this band with the changes and direction. But as Ghost played on with some wardrobe changes, and a set list of songs that everyone was familiar with, the band did squeeze some of the new songs in between. 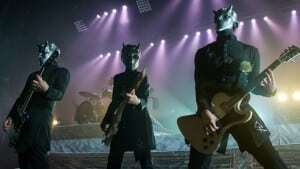 As the curtains opened the band of Nameless Ghouls, wearing their signature silver devil like masks, jumped into “Rats” the first single from the upcoming album Prequelle out Jun 1.
the band as an instrumental. In the middle of the song, Papa Nil (head of Ghost’s Clergy) emerged with two nuns, stood from his chair, pulled out his saxophone, and belted a solo. After playing a few more songs, the band took an intermission and then singer Cardinal Copia came back out in a typical red Cardinal robe. Two full sets played over two hours was epic. During songs like “Mummy Dust” there were cannons shooting gold confetti creating a shiny flurry in the air. They also played the crowd favorite “If You Have Ghosts”, an early 80’s cover by Roky Erickson, ending the night with another new song, “Dance Macabre”. All in all, it was a very exciting, visual show. Be sure to grab tickets for The Forum show at the end of the year because they will sell out again! 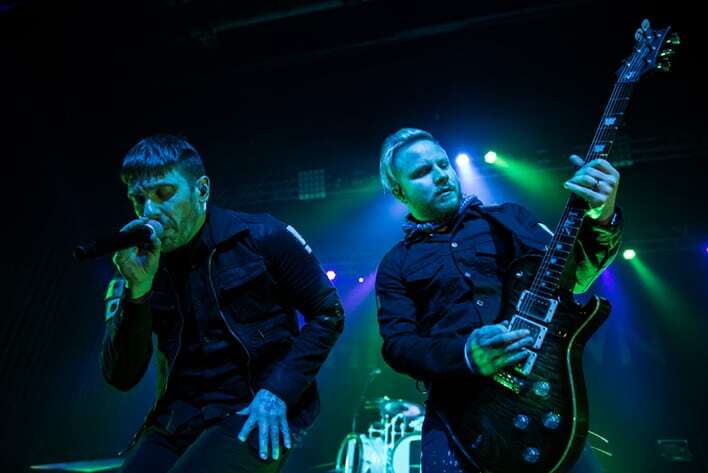 Shinedown hit Riverside Apr. 12, as part of their Attention Attention Tour and will return to SoCal Aug. 4 stopping at Fivepoint Amphitheatre with Godsmack. As I arrived at the venue 30 minutes before the show, I noticed right away that the line to get in went around the building. Once I was inside, I noticed how crowded and packed the venue was. I’ve shot a few sold out shows here at the Riverside Municipal Auditorium and it was unusual for people to come out early and pack in the venue as the doors opened. I ran into familiar faces in the photo pit while waiting for the headliner, Shinedown to take the stage. They opened with “Sounds of Madness” and the crowd went crazy singing word for word. After the first song ended, singer Brent Smith thanked the audience, the staff and us, the photographers, for the work we do and shook all our hands. This was such a humbling experience. While shooting the standard first three songs, I really enjoyed the energy from the band. The sound, the lights, also. This band really puts on a great show, one to see. In fact, the audience was on their feet the entire time. They only played a couple of new songs and ended the show with their cover of Lynard Skynard’s “Simple Man”, one of my all-time favorite remakes, followed by the first single “Devil” from the upcoming album Attention Attention. Metallica. The name says it all. Coming live to Southern California in my favorite town, San Diego. I’ve been a longtime fan of this band since 1983. You can’t imagine the thrill it was to get the approval to shoot and cover the show. Not knowing what to expect from the venue (Petco Park) or the band, I was as ready as I could have been. Driving to downtown San Diego I went early knowing there were going to be 50,000 plus fans going to the outdoor area. After I parked, I walked around the city until it was time to check in. At the venue, I met up with a couple of friends and fellow photographers that were also covering the show. Once we had checked in and received our credentials, we waited to be escorted to the floor to shoot the opening bands Gojira and Avenged Sevenfold. Then as we waited for Metallica, the excitement was growing for all of us. When it was time to walk back down to the photo pit, my fellow photographers and I fist bumped each other as if we were going onstage. 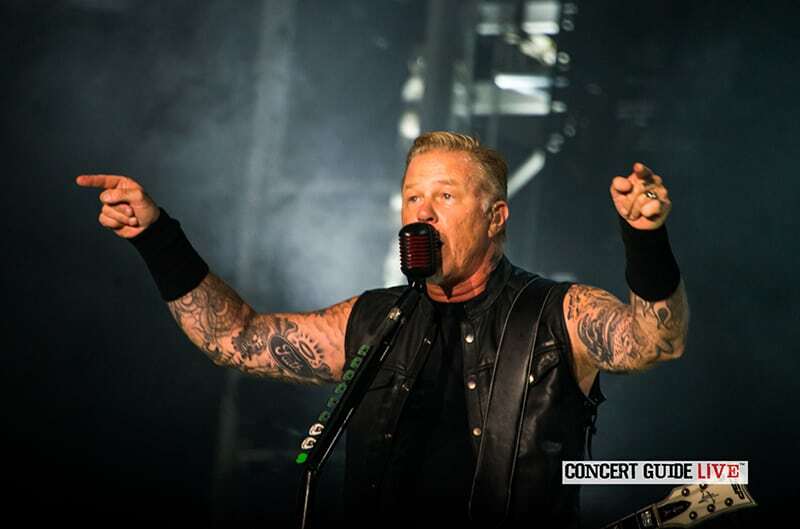 The band opened their set with “Hardwired… to Self-Destruct” sending the crowd into a frenzy while towering video screens over 100 feet high showed the band playing. The most difficult thing about photographing Metallica was working with the stage that goes into the center of the crowd, known as The Snake Pit (where Metallica fans stand in the middle of an opening of a ramp that goes into the crowd). The Snake Pit ramp was at my eyelevel, which is pretty high, but for a big stadium area it’s common. 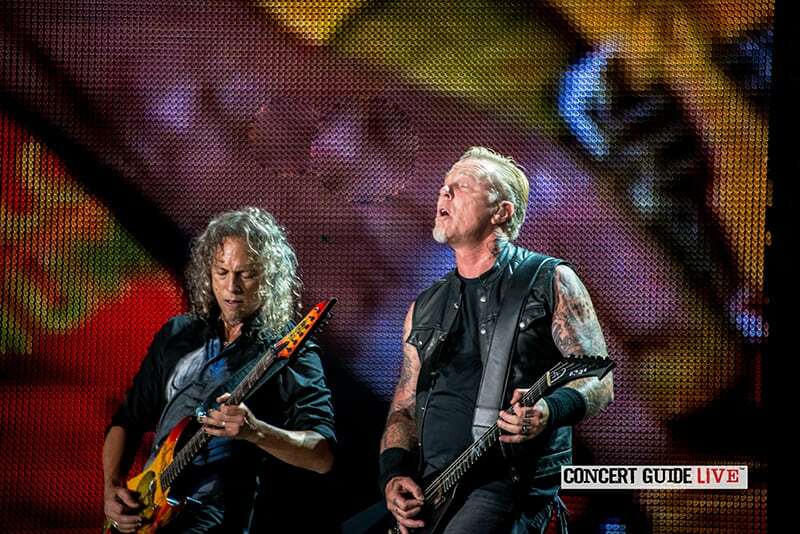 Getting to shoot the first three songs, “Hardwired”, “Atlas, Rise!” and “For Whom the Bell Tolls” was challenging, but rewarding. After the shoot, I had to remove my camera from the premises before I could go back in to watch the rest of the show. 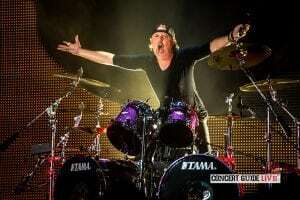 Metallica had a great mix of new and old songs. During a new song, “Now That We’re Dead”, all four band members played a Taiko drum (Japanese style drum) solo. For the song “One” which is known for opening with battle sounds, pyrotechnics and fireworks were added to the war sounds that went around the stadium. Such a great visual for the fans. But playing classics such as “Master of Puppets” and “Fade to Black” it was obvious they were crowd favorites. Everyone was singing word for word. It was great watching the band play these songs, which still hold up, and watching the crowd react. It just made the experience even more enjoyable. 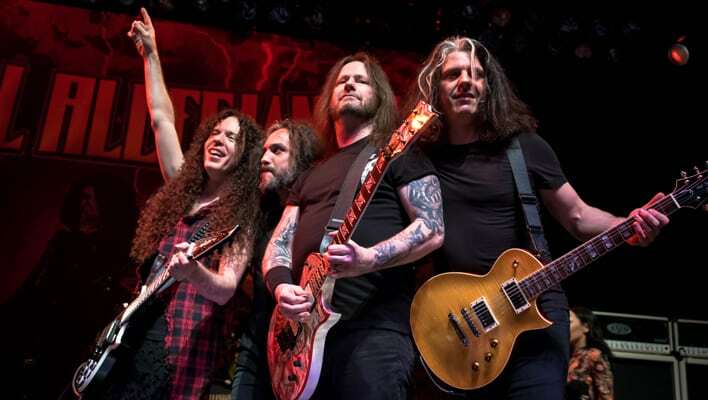 The band finished with “Seek & Destroy” from their first album Kill ’em All. As they left stage the crowd knew they were coming back. Obviously, a huge band in a huge venue, they had to please. And they did. First song of the encore was a classic thrash song from the early days, “Fight Fire With Fire”, followed by two radio favorites, classics “Nothing Else Matters” and “Enter Sandman” as well as a huge firework finale. Metallica has over 30 years as a band and they still sound great and are great musicians. 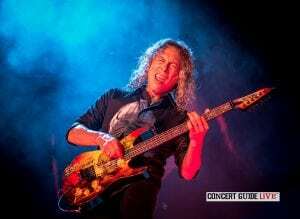 Solid as ever, the WorldWired Tour continues with SOLD OUT shows until May 2018. This band has made their mark on music and influenced many in the industry. And the joy of capturing it on camera is absolutely one of the highlights in my life. 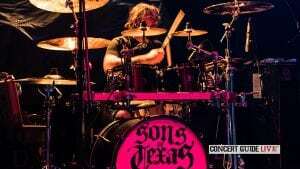 Sons of Texas opened for heavyweights Hellyeah at the Observatory North Park, San Diego. When asked to cover Sons of Texas, I was excited to see Hellyeah (one of my favorites) but I did my research and listened to Sons of Texas’ CD Baptized in the Rio Grande days before the gig. Next thing you know, I’m buying the album on iTunes! I arrived at the venue to find there were minor issues with my photo pass. This happens from time to time, but everything worked out. This is why a photographer should arrive early to a venue. Excited, but not knowing what to expect, plus this was my first time shooting at this venue, I walked around, grabbed a drink and checked out the merchandise before the show started, then headed to the photo pit. The venue had great lighting and a great ambiance. 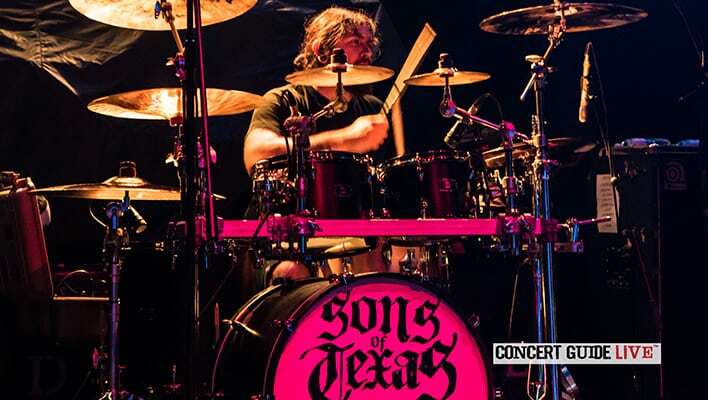 As Sons of Texas opened playing “Never Bury the Hatchet”, these guys were top notched musicians! I noticed right away how perfect they fit on the bill with Hellyeah, and could hear the influence of Pantera and other bands. Sons had great energy that got the crowd going. 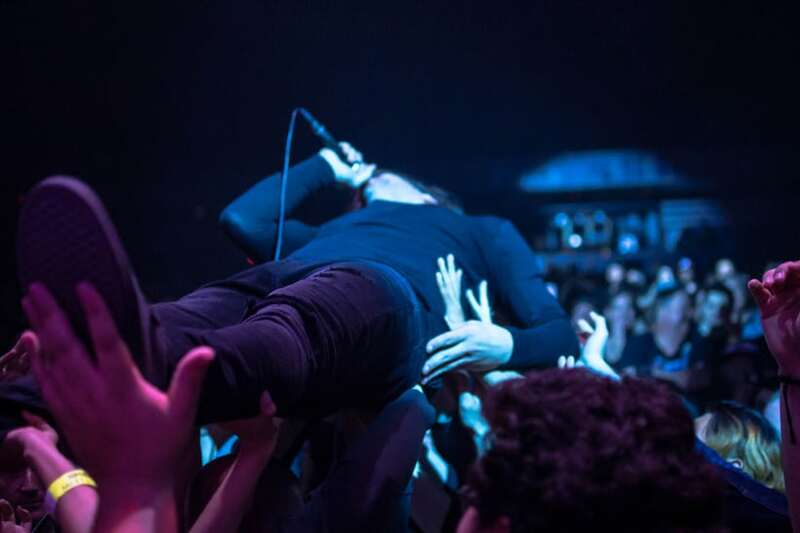 During one song in their set, singer Mark Morales jumped in the crowd singing as a small mosh pit went around him. They played most of their debut album and did not disappoint. Great performance also equals great compositions. Even after the Hellyeah performance, the band was hanging around greeting fans. I definitely had to go over and say “Hi” and bought another copy of their CD to get signed. I will be looking forward to seeing these guys again either covering their concerts or just attending as a fan. In fact, I kicked myself when I found out they had played a couple headline shows in the past week here in Southern California and I missed them. But I’m sure they will be headlining more shows in the future. I can’t emphasize how good these guys sound live and couldn’t ask for a better end to my Father’s Day than seeing these two bands play. Skillet headlined the Grove of Anaheim in support of their latest release Unleashed with two great opening bands, Sick Puppies and Devour the Day. As I arrived early at the venue, the one thing that instantly amazed me was how many cars were already in the parking lot. I had a feeling this venue was going to be full and possibly sell out. When Devour the Day took the stage they had a fantastic stage presence. But a funny thing that has never happened to me occurred during the second song. As I was turning around after taking a great shot of singer Blake Allison singing while he surfed the crowd on his back, the microphone stand hit me in the face! I then noticed that his microphone cord got wrapped around the base while he was going through the crowd. That was a first for me and I actually thought it was funny. I’d rather get hit in my face instead of hitting my camera. As I brushed off my wounds I finished my three songs for the first band of the night. I’m very familiar with Sick Puppies, who were the next band to play, having photographed them before plus I was excited to see the new singer, Bryan Scott. For being a three-piece band they know how to entertain and sound amazing. 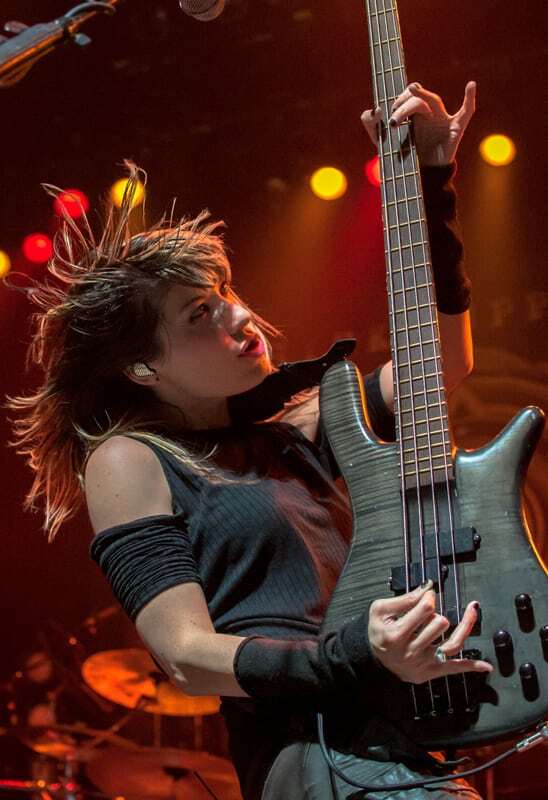 Bassist Emma Anzai is always fun to shoot. Her slap style and hair blowing around is always a great visual. My obvious favorite band of the night but I would say 90% of the crowd was there to see Skillet. Yet, I’m sure Sick Puppies won over some new followers. 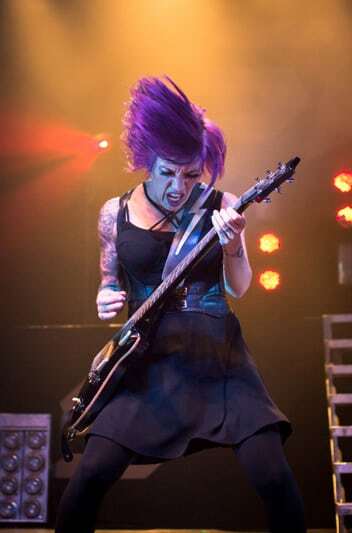 When headliner Skillet took the stage the crowd was cheering with excitement. They opened with “Feel Invincible” with the crowd reciting every word. 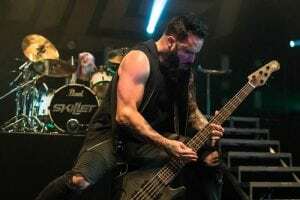 Skillet has been around over 10 years and have a strong Christian base. This band knows how to play and knows how to entertain. Singer John Cooper and wife Korey on guitar are full of energy. I’ve never seen this band live before but seeing their energy along with their fans’ (known as “Panheads”) made for some great compositions. Using one camera, I was switching from a zoom lens to a prime lens (faster lens that doesn’t zoom). 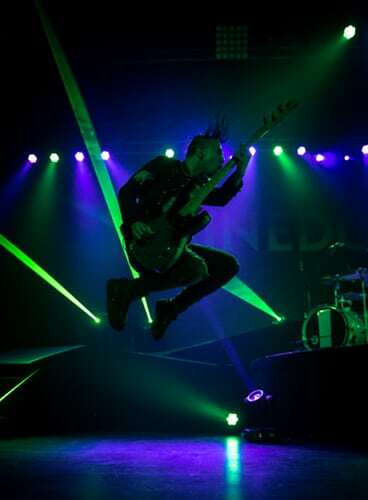 With a band like Skillet jumping around and all of the fast action, I needed the faster lens. The three songs I was allowed to shoot went by quickly! It was an all-around great show to see and to photograph making it a very successful photo opportunity for me. And one thing I can say about the Grove of Anaheim is that I love the lighting in this venue. I have never had a bad shoot there. Grammy Award winning band Ghost, who won for Best Metal Performance this year, recently played the Riverside Municipal Auditorium. For the past two years, there’s been a lot of buzz brewing for this band. I had the chance to see them at Coachella for the first time back in 2013. I was intrigued then with their stage presence of metal with heavy demonic overtones and was looking forward to this event. When the lights went down, operatic music began to play, the stage crew came out wearing the Ghost logo, an upside down cross with a “G”, on their shirts, bowed to each other and removed the black cloaks covering the drum set and keyboard. The scent of incense burned on stage, creating a church-like atmosphere. 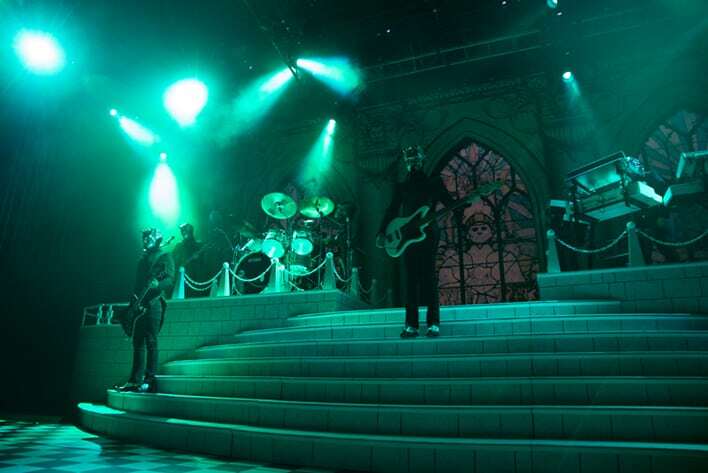 They opened with “Square Hammer” a new song from the Popestar EP, a followup to last year’s album, Meliora. Singer Papa Emeritus III came onstage dressed in a black “pope like” robe and skull makeup. This is exactly what a photographer loves to see in a stage show. 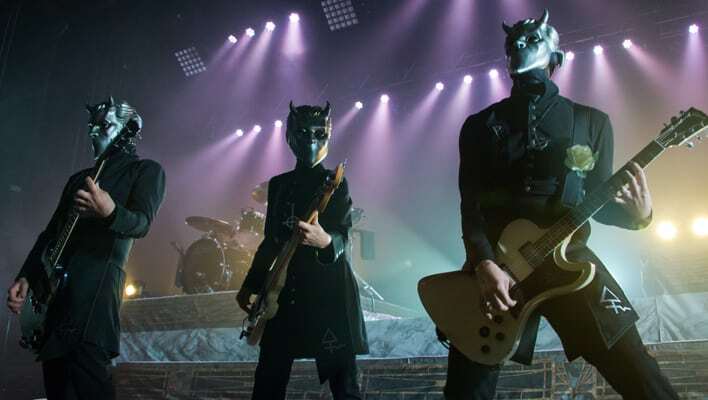 The band members are called “nameless” ghouls and wear silver masks with horns and eye cutouts but no mouth. 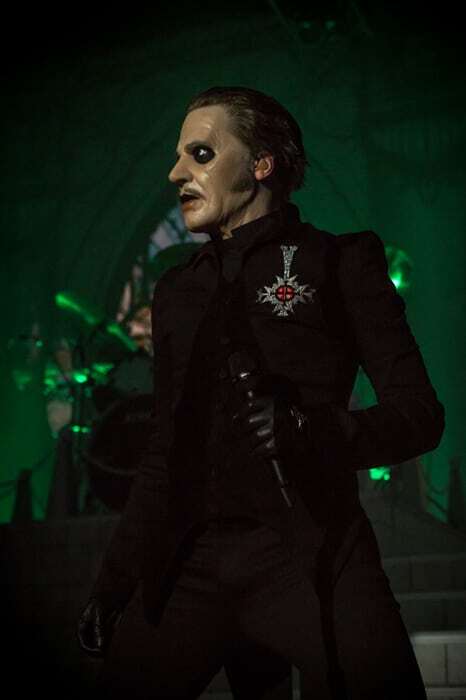 Scanning the crowd, I noticed there were fans wearing make-up like singer Papa, replicating their allegiance to Ghost. After shooting the first three songs, we photographers had to vacate the photo pit, which is standard practice. Most of the photographers went to the balcony to get full stage shots until the security stopped us and made us go downstairs. Trying to shoot from the floor was hard with the general admission crowd, and eventually security told us we couldn’t shoot at all. I’ve shot this venue before with all access to the balcony and other places, but they were strict with this show. The band played a total of 17 songs but during “Mummy Dust”, guns shot confetti and dollars with Papa’s face on them into the crowd creating a visually stimulating atmosphere. The Swedish group formed in 2008 and I am sure will stay around. Hopefully, I’ll be covering them next time they’re in Southern California. Great music and a great visual show. 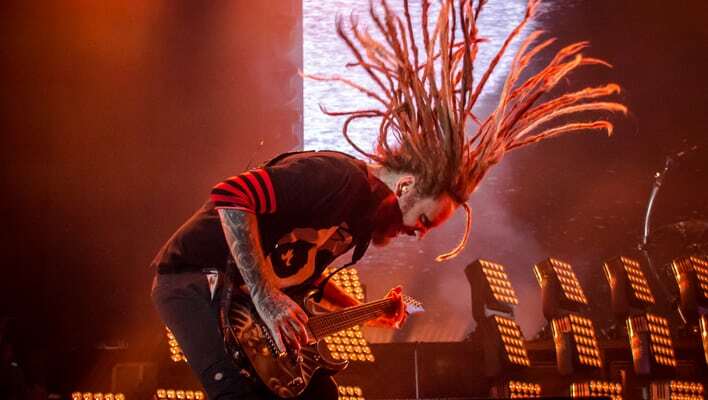 “Return of the Dreads” came to SoCal with a lineup that featured In This Moment, Rob Zombie and Korn. SoCal hasn’t had a rock fest in a while and this was guaranteed to sell out. Arriving at the venue, there were issues getting in. Key to being a photographer is being early to shoot all the bands on the bill, but unfortunately I did hit a snag. As soon as I got into the parking lot there was a lot of walking. As I arrived at the box office to get my credentials, I was given a photo pass but the venue staff said I also needed a ticket to get in. I could hear that In This Moment had already taken the stage. After other photographers were denied entry, another staff worker walked up and said we could all go in. I walked as fast as I could while getting my camera ready. But once I showed up to the stage, In This Moment finished their last song. Since we’re only allowed to shoot the first three songs of a set, I had missed my opportunity. But running into friends that are photographers, they also had the same problem. 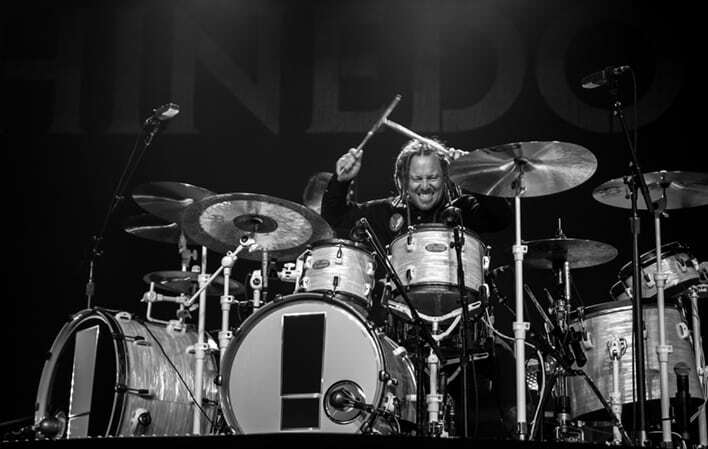 But never-the-less, I was able to shoot Rob Zombie and Korn. When Rob Zombie took to the stage I already knew he never disappoints the fans. His stage was full of his visions of horror and pop art, including a microphone stand that had a Nosferatu looking metal base. There were overwhelming red lights that are hard to capture in photos so I switched my camera to shoot black and white and was able to get great shots of him and the band. However, the color photos captured the vibrancy and mysticism of the band. 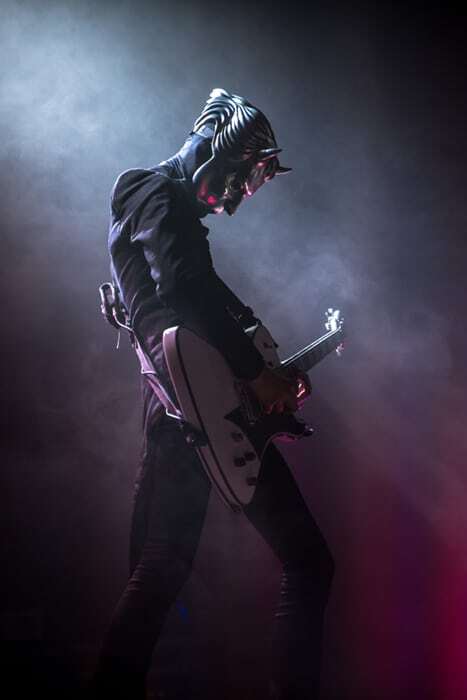 As Rob loves to entertain, he and guitarist John 5 had an oversized Devil walking around the stage that he interacted with. Such a great stage presence and a great showman. Even while John 5 showcased during a solo, Rob was running around the crowd getting them even more enthused. While we were waiting for Korn to come on stage, the photographers were escorted back down to the photo pit. Right away, I was in the presence of singer Jonathan Davis’ mic stand, which the legendary artist/sculptor H.R. Giger designed for him years ago. When drummer Ray Luzier entered the stage that was my key to get the camera ready. The rest of the band came on, bassist Fieldy’s neon bass strings were glowing, and the band went into the first song, “Right Now”. The crowd was jumping! Great lighting for the band made it easy to get the shots I wanted. 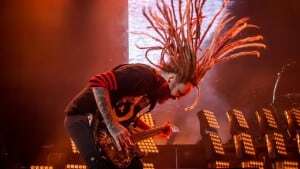 And as the tour was called “Return of the Dreads” both guitarists, Head and Munky, had dreads that made great action shots while they were rocking out to their performance. I’ve seen these bands many times before, they sounded great but this was my first time shooting them. It was a very entertaining show and a great experience to shoot and share. Although these bands have been around for a long time, their new songs also sounded great. If you are a fan, check them out next time they come around.